Serious cold mornings. Sure there had been a few nights in the high 20’s early in the month, cold enough to kill the peppers and warm season weeds but we are moving into sustained cold nights now. Starting with 19 degrees last Sunday morning we have been down in the low to mid 20’s every morning this week. We joke sometimes that we should have named the place Polar Cap Farm because we are always so much colder than most of our fellow market farmers south of I-85. I was at a meeting this week and several of them had just had their first killing frost on Sunday and were shocked that we had gotten so cold. Just part of living down in the Haw River valley I guess. Not only does this kind of cold kill the last of the warm season crops but combined with the day length below 10 hours it also essentially stops the growth of even the hardiest of the cool season crops, kind of puts them in the refrigerator for cold storage. From here until late January, when the day length again goes past 10 hours, crops grow imperceptibly and we are basically harvesting what was grown during the fall and taking them out of “cold storage”. One of the good things that happens is these cold hardy crops get sweeter. The higher sugars are their anti-freeze, it helps to keep their cell walls from bursting when the water in the plants freezes overnight. So while stocks will be dwindling, each bite will be better and better. The farmer’s main job now is protecting these crops to keep them from getting too stressed from cold and wind. The floating row covers are out and the sliding tunnels are closed up. 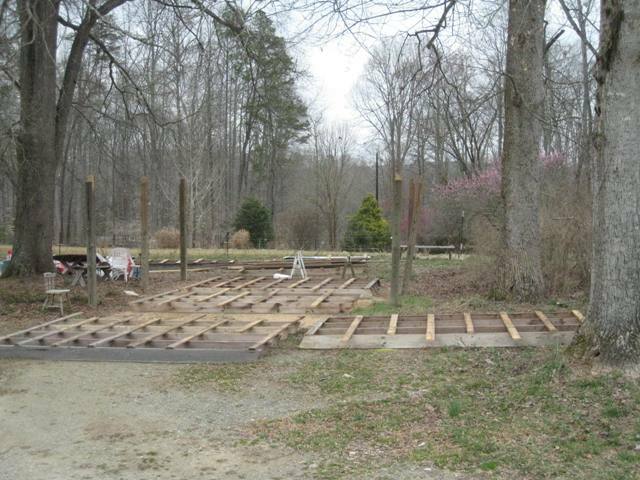 The sustained dry spell has been good for progress on the workshop project. The floor system for the second story is done and this weekend I will get the second story walls up. We are headed for having the roof on by the end of next week. Cross your fingers. We made it past the cold weather without any real damage other than some fig leaves being burned a bit. 26 degrees on Thursday morning and 31 on Friday. 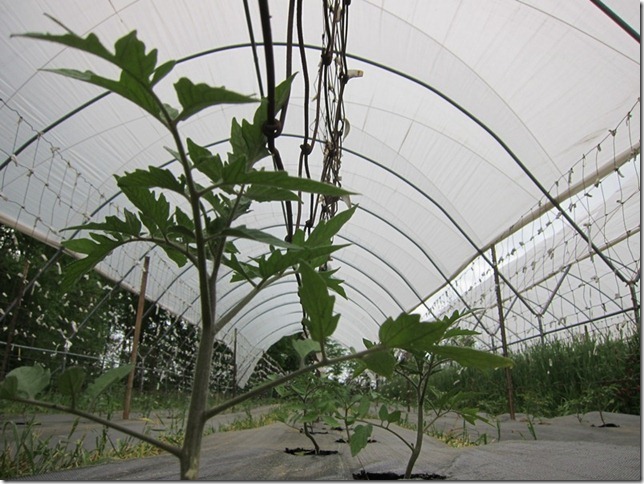 As soon as it warmed up on Friday we began to slip the tomato transplants into the ground. Perfect day, not too hot and no wind to stress them while they are getting used to their new home. A nice watering in with the hose and then a deep irrigation a few days later and they look fantastic. Today is the next step for the peppers, we seed them into small cells to maximize space in the germination box and then move up only the best looking seedlings into larger cells to grow larger until they too go into the field in just about a month. Nearly 3000 plants to move up of thirty plus varieties. Another perfect day for this job too, cloudy and cool which will make the greenhouse conditions less brutal on the tiny plants as they recover from being pulled out of one tray and poked into another. Finally a bit of rain last night after a solid week of irrigating to try and catch up on the surprisingly dry conditions. Things look much better including the onions that have looked like hell for weeks. The now annual water watch has begun. Just like last winter and spring (2010-2011) when we got fairly regular small rain events but never really enough to recharge the ground water we are in the same pattern this year. The creek is running well but the upper pond only came up about a foot over the winter. A month ago we began the process of filling the upper pond by using the irrigation system pump to move water from the lower pond. Over 140 hours of pumping later and the upper pond is full and at least six feet deeper than it had been. Hopefully we will not have to use it this summer but it feels comforting to have it there. Cold, cold, cold! 12 degrees this morning, second time in a week. This is just amazing and another record setting weather phenomenon. 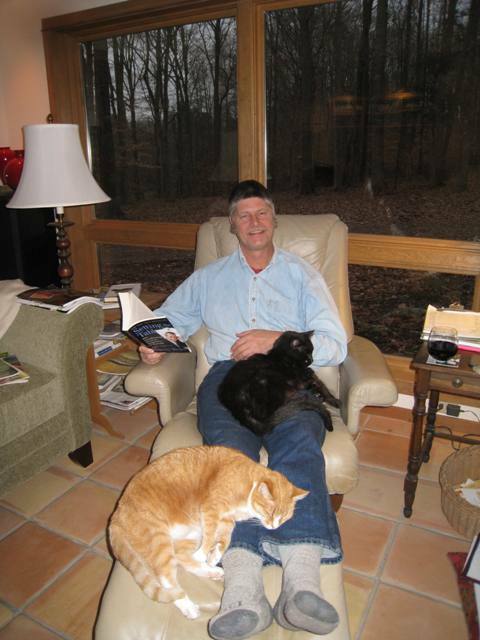 It has been hard to get much done outside so it is good we didn’t have any big projects we needed to get done. It is the beginning of the meeting season and I have had three board meetings in the last month and the Carolina Farm Stewardship Association conference so a little time at the desk has been welcome and needed. Soon we will have to buckle down to plan all of next years crops and order seeds, followed quickly by the time to do the end of the year books. Good thing we have plenty of fire wood to keep us warm with all of this indoor time. We hope you all had tasty and sumptuous Thanksgivings, we thought the turkeys and produce were some of the best we have had. As promised I finally have had time to get the travel reports up on the website on Italy and Terra Madre and the Spain food explorations. I know some of you have already been to the website to see them but others will hopefully enjoy. The winter looks to be filling up with the normal greenhouse work and other farm chores and further extra-curricular activities. The seed catalogs are just now starting to arrive in the mail and so our thoughts are turning to what new crops we will find to try this coming season. We do have the five new peppers from Spain and the new tomato from Italy for sure. Betsy already has the first Lisianthus plants up in the greenhouse and lettuce was seeded this week. All too soon it will be Ground Hog Day and spring will be peaking around the corner. If we don’t see you at market this Saturday, we hope that you all have a warm and satisfying winter. Some cold lettuce and turnips under the floating row cover. Well some of you caught us at Farmers’ Market last week, on our inaugural outing. Really more of a shakedown cruise to make sure we could find everything and remember how to do it. After six months of not going to market it takes some re-adjustments to find the right tables and the cash box and signs, etc. It was great to see everyone we talked to and the market seemed alive with souls who are more than ready for this endless winter to cease, farmers and customers both. When I sent the last newsletter out in January, at that time starting to be amazed at the duration of the cold weather, little could we have imagined how long it would really last. 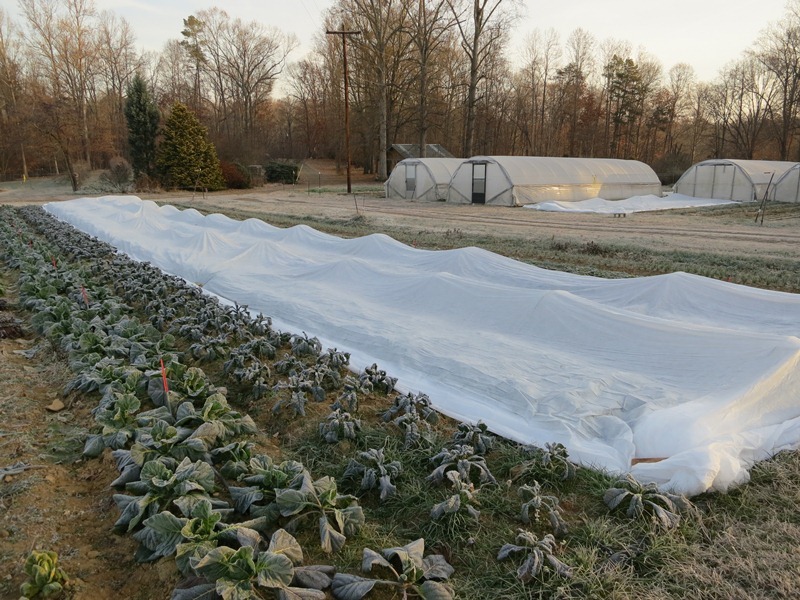 Certainly now, standing at the brink of our 29th growing season, we can say that never have we experienced such a winter in North Carolina! It has not been so much about the amount of snow or threats of snow we’ve had but the string of days below fifty degrees. In years past we would be out occasionally working in thirty and forty degree temperatures but usually there are enough days in the winter when it warms up past the fifty degree mark that we would just save up the outdoor chores for those days. This winter has seen only a dozen or so days when it got above the average high temperature (which most of the time hovers just above that fifty degree mark). What does this all mean besides we are really out of shape and can barely move after some of these first warm work days? It means that most crops are going to be running very late this spring. Some people I have talked to are saying things look three weeks behind right now. If it warms up in some reasonable fashion those delays will shrink. I can say we have been up to three weeks delayed in getting some things in the ground and I have officially moved back the seeding dates for most of the spring vegetable crops by a week over last year. Cold soil means really poor germination rates for things like spinach, beets and carrots. The transplanted crops, like lettuce, will go in on schedule and usually catch up with the arrival of warmer days but I would say that they too will be off by at least a week this spring. Despite the weather, the staff started back to work this week, for at least a few days, because we do have a lot of maintenance work to get done. The first job was dismantling the shed roof that collapsed in the January snow. It took all day to carefully take it apart so we can, fairly easily, reconstruct it before the Farm Tour in April. Cov and Glenn are both back for this season and it is really nice to know we have skilled help when it comes to getting these kinds of jobs done as well as the inevitable catch up work we will need to do when it warms up for good. Nothing left of the Stand but the posts and the de-tinned roof structure. 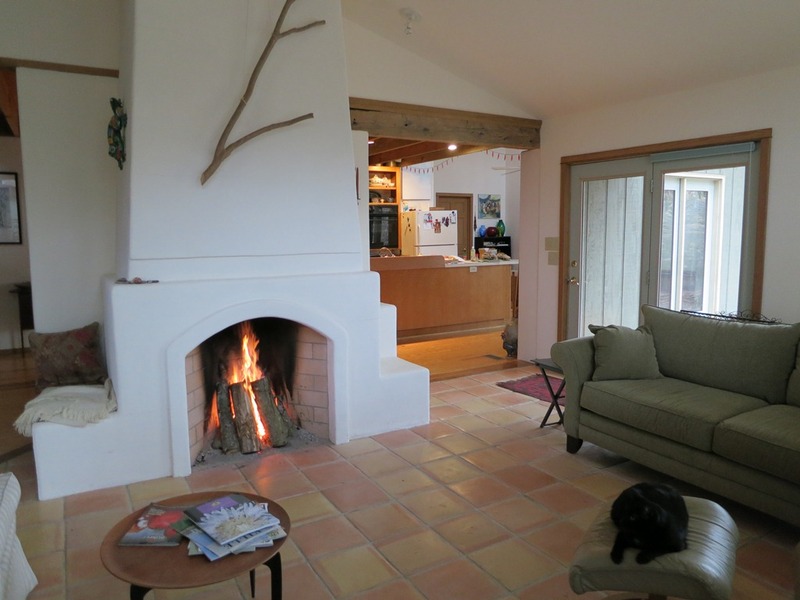 A new year, a new decade and a mid winter newsletter. Betsy and I hope everyone has passed the long cold period and dark days comfortably. Quite an amazing cold snap, certainly not the coldest temperatures we have ever seen but we can’t remember so many days at or below freezing here on the farm. We do remember the last time it did happen back in 1977. We were in college in Utah and read, with amazement, as the reports came in that it was so cold in the East, that the Ohio river was frozen so hard it popped the coal barges out of the water and power plants were running out of coal! As folks who heat with wood, we burned an amazing amount of wood this January too. The cold and wet weather that began in December has driven us into the house for most of the last two months but we have been productive while clanking away at the computer. All the seeds have been ordered and Betsy is beginning to fill up the greenhouse with transplants. Having taken most of the winter off from teaching/speaking engagements has given me time to finally work on and get http://www.peregrinefarm.net up and running. A combination of website and blog you can now find information about the farm all in one place. I will continue to send out the weekly newsletter during our market season and it will also now be on the website as well. The blog portion of the site will also allow us to post other items as they occur to us, it will allow people to comment on posts and it has archives of past newsletters too. Please go to the site and check it out, there are many links to our favorite groups, places that buy our produce and to pieces about the farm on the web. We will be adding more information pages as time goes along. If you would like to subscribe to the website and blog you can do that too, look for the subscription box on the lower left of the website. If you do subscribe and would prefer to get the weekly market newsletter that way instead, just let me know and I can take you off this email list so you don’t get double newsletters. Who would have thought we could be drug into the 21st century! We haven’t spent all of our time by the fire or in front of the computer. We did manage to get the house painted, a well house built over the well at the greenhouse and the firewood cutting season has begun. We had a great turn out again for the Triangle Slow Food New Years day meal and gathering. 200 folks enjoyed a relaxing time and great southern traditional New Years food including collard greens from us. Betsy and I also had another fun weekend at the Southern Foodways Alliance weekend for the Fellowship of Southern Farmers, Artisans and Chefs several weeks ago in Tennessee. 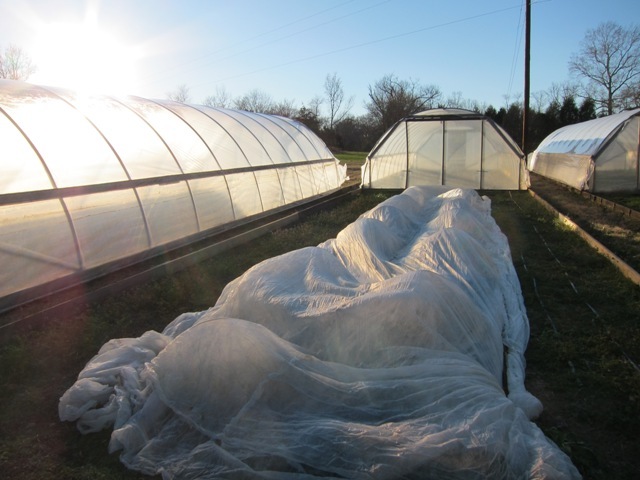 Now that it might stay warm for a few days in a row we are beginning to plant a few things in the sliding tunnels and generally getting mentally ready for spring. We will see what Punxsutawney Phil and the rest of the groundhogs say next week. It’s not all hard at work! Seed catalogs on the left, cats holding Alex down, and a glass of wine on the right. Hope to see you all at the market soon!